Here are a few Hot Chocolate Bar Ideas for easy entertaining friends and family. It was fun putting this event together and pretty simple to serve. 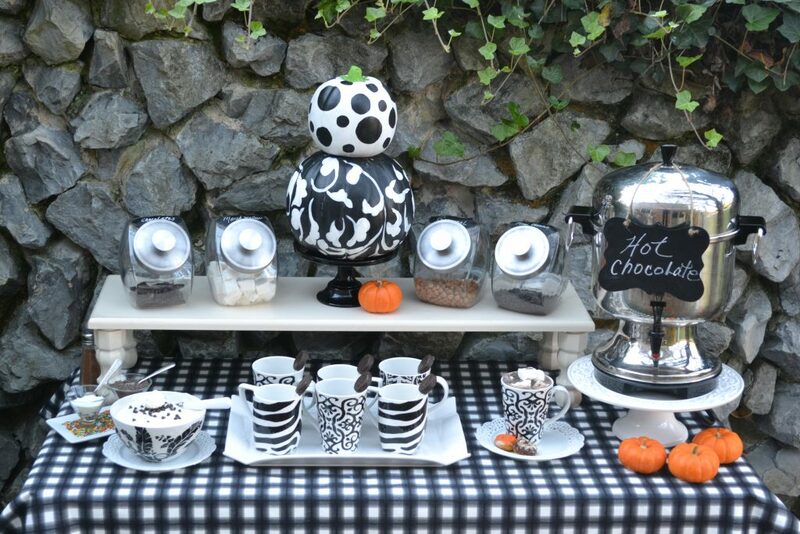 Start with a color scheme to help set the tone of your hot chocolate bar. Because I have a lot of black and white mugs and accessories this color scheme was perfect for my bar. The fun part was the toppings and the containers to hold them. This was Featured on Wayfair.com. Two faux pumpkins were painted, one black and one white, then decorated with hand painted dots and swirls. I had these from another event and thought the black and white would look great with my table. The two mini orange pumpkins added a pop of color and whimsy to the tablescape. Click here for the Black Cake Stand. 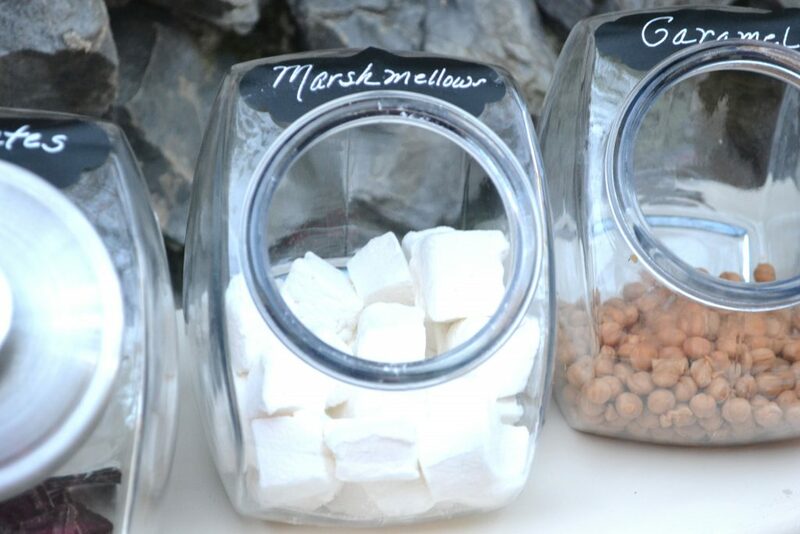 Decide upon the toppings you want to serve on your Hot Chocolate Bar to determine how many containers you will need. The small candy canisters with the lid on the front were found at Walmart in the home good section. They were filled with mini chocolate chips, homemade marshmallows, mini caramel bits, and Hersey chocolate bars. Each jar was labels with an adhesive chalkboard sticker. I used a special chalk paint pen to write on the sticker. I could have used chalk, but it always smears and my printing doesn’t always turn out great. The caramel bits by Kraft are really good. You don’t have to unwrap to melt. Just pop them in your Hot Chocolate and they melt after a few stirs. For a fun treat, I used York Peppermint Patty on a stir stick as a garnish for the Hot Chocolate. Regular coffee plastic stir sticks were used. The Peppermint Patty melts slowly as you stir your chocolate, if you can actually keep it long enough to stir in. Eating it first is always refreshing and good. The hot chocolate beverage is made with 2% milk and half & half, special Dark Chocolate by Hershey. Its a pretty simple recipe. The toppings add the fun and more flavors. On the table I have a black and white bowl full of fresh whipped cream. I like to use Heavy Whipping Cream and a bit of confectioners sugar to make my own whipped cream. I also add a bit of flavoring to it.. usually almond or clear vanilla and sometimes creme bouquet extract. Idea #7 Have a fun time! I presented this bar idea on Good Day Tri-cites and we all had a great time. This was also aired on WCYB TV 5. To see how to make the Pumpkin Topiary, click here. 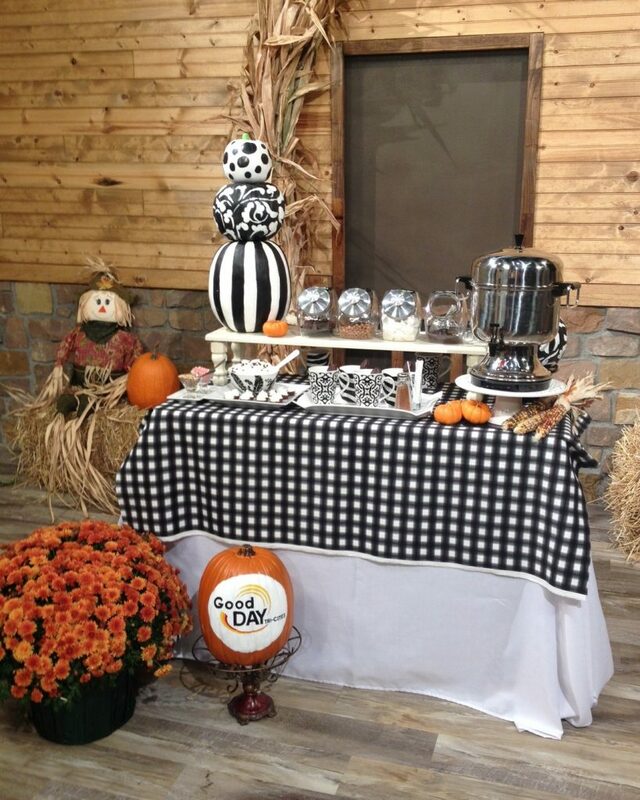 To see Best Black and White Pumpkin Tablescape click here. 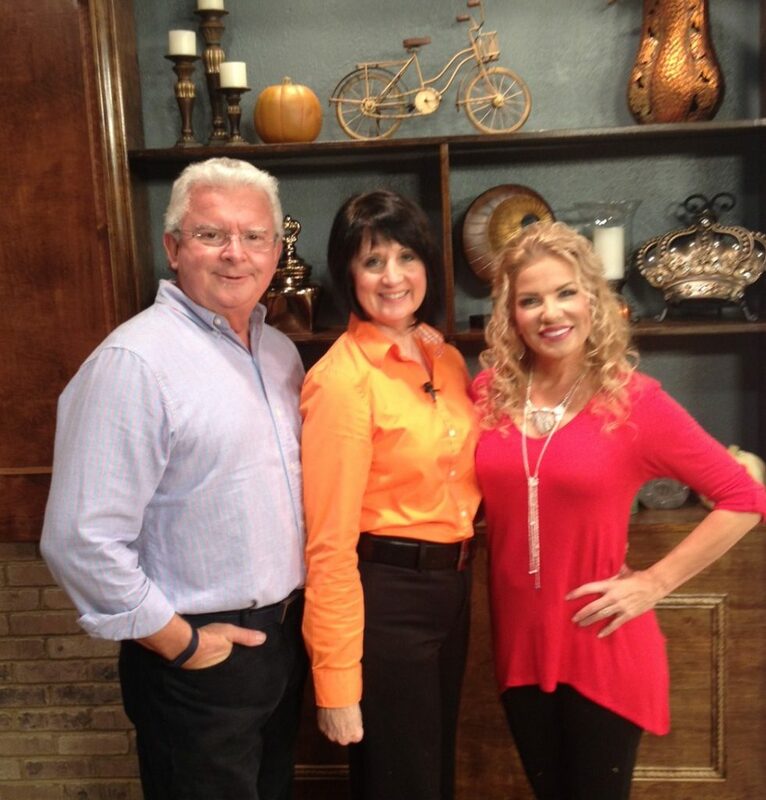 Morgan King co-host left, me, Whitney Carr on the right. I was so thrilled to be featured in Wayfair .com. Here are a few highlights. My favorite color scheme for fall is black and white; you can use this color scheme with any pop of color. I actually use black and white all year round. For fall, bright orange or Pantone 2017 color Autumn Maple is a great complement to the black and white color scheme. Depends on the fabric content of the tablecloth whether I hand wash, toss in the washer and dryer or hang to dry. If it is polyester and a cotton blend, I will toss it in the washer and dryer until almost dry and then hang it to dry and steam press it myself. If the tablecloth is linen, it is spot cleaned then sent to the dry cleaner. My tip for spot cleaning tablecloths and napkins is to pre-treat the stain as soon as you can after the event with liquid dish soap. Apply lukewarm water and dish soap for a stain that has water in it, and a solvent for a stain that has grease or oil like lipstick. Gently blot both sides of the fabric so the stain will bleed off onto the blot cloth, then rinse the area and let dry. If this doesn’t remove the stain, take it your dry cleaner, and they should be able to help you.